The Benn Hall during the first stage of the hearings. The second phase of the hearing will begin on April 17 and last for 10 days - it comes after the first stage ended on February 1. The second stage of the examination will focus on housing allocations at villages in the borough together with gypsy and traveller allocations, economic development policies and sustainable design, among other matters. It will take the form of a discussion, led by government- appointed inspector Mike Hayden – who also conducted the first stage of the hearing. Writing to the council Mr Hayden said: “I should make clear that this is not to be taken as an indication that the Plan as a whole, or any particular part of it, will be found sound. Subject to space, the meetings will be open for the public to view. Visit www.rugby.gov.uk/localplan to see copies of the inspector’s correspondence, including guidance notes and a draft timetable. 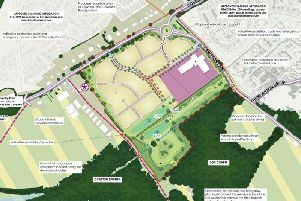 The Local Plan sets out where in the Rugby Borough housing and employment land should be allocated and identifies the supporting infrastructure that will be needed. The draft plan was approved by councillors in June 2017 – to the dismay of campaigners.